Worst call of the season........Terrible for that ball to be called a forward pass. You could have called Grounding if it was forward, which it wasnt. The refs tried to take away our victory but they failed. 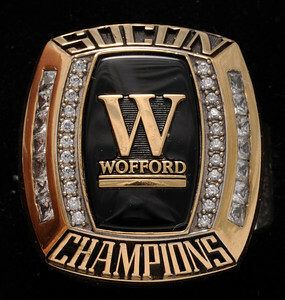 Chatty has become the SoCon's "darling"
http://woffordterriers.com/news/2016/11 ... nooga.aspx Just the facts, ma'am. I was there but for both the pass by Bennefield and the personal foul they happened so fast I am not 100 % sure what happened. I did see the pass but I would have to watch it again to decide for sure what it was. But I remember when Bennefield threw it (if you could call it that) I thought it was a forward pass but it was so close as far as I could tell that I could not decide for sure from just seeing it just that once. As for the personal foul I did not see it at all as I thought the play was over and I was not even looking at the sidelines. What a game changer that could have been if they had won it. Because wasn't that 4th down or at least 3rd when we supposedly comitted the personal foul ? It it was 4th down like I thought the game would have ended right there if not for the foul. Anyway the Terriers were clearly the better team as a whole for the entire game although our pass defense was suspect at times. Amazing how they scored a TD so easily with 10 secs left in the 1st half. Despite our weaknesses I am very happy with the win. We were the better team. No doubt about it. However 19 makes a good point - that if it was a forward pass why was it not grounding ? He obviously tried to throw it to avoid the sack. A couple of tidbits of info that I got a chuckle out of. To give you a little background info about the Chatt newspaper, it seems that every game the local prognosticators of the paper always think the Mocs are going to win and win big. Not just against the Terriers either. It seems that they do not do their homework and just pull a score out of mid air and put it in the paper as a sure thing. This week was no different. One article said the Mocs would win 38-13 and another said 37-17 (I am quoting from memory but you get the idea) which are close to blowout games. Not very close and not giving the other team much respect. I have little or no respect for people that snub their noses at supposedly a lesser opponent. But the Mocs team - coaches and players - are the opposite. They do show respect for the other team before and after the game no matter the outcome. Another tidbit happened at the Chatt game when Wofford went for it on 4th down the second time after they did not make it on the first. One obnoxious Chatt fan near me stood up and said over and over about 5 or 6 times 'Go for it on 4th down Wofford' and you could tell he was trying to bait the Terriers into going for it. That was a period in the game when the Mocs seemed to have some momentum and he obviously felt confident that his team was going to win and we would look like fools for going for it on 4th down. Then momentum seemed to turn in our favor as I remember. But when that happened the obnoxious guy did not say anything else. As a whole the Mocs fans are nice people and have respect for the other team but this guy obviously was not one of them. Also saw Mikel Horton's dad in the stands and Dominique Lemon's dad as well. I know I could go back and run that pass play over and over-but it wouldn't matter. Our announcers said that the player near Bennefield was an eligible receiver, so the intentional grounding is moot. However, IF the pass was not forward, it was a free ball and was recovered by Wofford. As for the press, it seems that oftentimes the local press covers a non-local big team much more than the locals. We are fortunate that Todd covers us while Ed is covering Clemson. If the locals covered the SoCon even reasonably they would realize that there are four teams that are hardly separated at all. Any ONE of the four can beat any other of the four any game and it probably would be close. I would think we could make an argument that Wofford is the best team, considering the way we lost to Samford (on the road) and The Citadel (on a freak fumble when we had all the momentum). However, The Citadel is playing this year with that horseshoe conveniently implanted in their posteriors, and have gotten all the breaks this year. I also think we should consider the character of this team, which has lost for the two starting QB's, two starting LB's, and has been missing additional starters in virtually every game. In addition, they have withstood some amazing bad calls and bad breaks and kept on persevering-CHARACTER. Was there yesterday with another old dog who has a son on the team. Very very proud of the way they competed to the end. They laid it on the line and no one could ask for more than that, win or lose. These guys have confidence in themselves. They are a good group. We came in dinged up a little and will play next week very dinged up across the board, but esp. on D. Hope Jaleel, Miles, Horton and Watson are back. As for the game, terrible PF penalty but we have to be smarter than to give the refs a chance to shaft us. Hustle play all the way but we have to be more aware. As for the "incomplete pass", RB Craine was supposedly "in the vicinity" which is why the refs made the call (per MA). I am not at all sure it was forward however and per MA the refs never gave him an explanation on that. Bad call on 4th down from our 31 (Dabo did the same v. Pitt and got burned). But we won anyway. My first trip to Chatty. Nice facility, fans were welcoming. We beat a very good football team. Signature win in a lot of respects but unless we win next week it matters not. We have to finish strong. Will not be easy. Hope we come to play. Maybe one of the best editions of TerrierVision! Great game film and interviews at the end. Didn't know we scored 14 points more than anyone this season on Chatty! By the way, the call at the end-no grounding/no fumble is well documented. IF there had been a replay review it wouldn't have been reversed, IMO. HOWEVER, had they called a backwards pass on the play, with us recovering it-that wouldn't have been reversed either! On the phantom late hit on the QB it appears our player launched himself before the ball was gone. It shouldn't have been called. Oh well, it gave our young defensive secondary a chance to gain even more great game experience, and they did a wonderful job. Good interviews with several of the players. Just wanted to drop by and congratulate the Terriers on a well played game. Wofford played better than the Mocs, end of story. Y'all deserved the W.
Dang, I wish. When the Mocs played VMI a couple of weeks ago, they were called for 1 false start for 5 yards, the Mocs got called for 12 penalties for 84 yards. If that is being the SoCon's darling, I would rather be it's ugly stepchild. boulder3m wrote: Maybe one of the best editions of TerrierVision! Great game film and interviews at the end. Didn't know we scored 14 points more than anyone this season on Chatty! I liked the additional sideline camera. That added some great team footage. I noticed that Thom was on the sideline/endzone...is that going to be a new thing or was Mr. Hipp already working the Presidential transition? Great coverage of a great game!! This was a convincing win by the terriers. There were a few unexpected surprises like Thad Mangum and Justus Basinger. Both played like the lights are on and will be great additions for our end of season run. I love our DL group, which may be the best group and best coached in FCS. Same could be said for our OL, but I am concerned with us not converting on 4th and short. I am however going to eat a little crow on Brandon Goodson. The kid has grown leaps and bounds since Samford game. Just hope we see the benefits of passing at least 15 times per game. There were a few times Lindsey/Cleary flat out ran the Chatt DB's. Don't know if Chatt was just sold out on the run or the kids just have the knack to get open. Good to see Mangum, Allstat, and Basinger stepping up ... what depth. Datavious and LoLo got nominations as well. The QB at Samford has had a heckuva year.